I built the kingdom on top of a large piece of plywood on top of a smaller table underneath, and covered it with a sheet on which I colored in grass and water. I also had a shelf behind it where there was a town up in the mountains. There were several towers, including one large "rainbow" tower, partially seen in the picture in the back, just to the left. 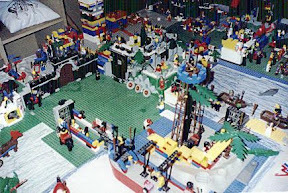 There were two main castles, two tower-like entrances, cannon ramparts, a boat, an airship (a flying boat with helicopter wings on the top mast - inspired by Final Fantasy), a dock, a tournament ground, a throne, and even a sword in a stone! I had several odd parts received from my cousin. He had tired of his Legos, so his mom gave me a box full of parts. Included were two moon landscapes, with hills and craters, one of which is in the foreground of the picture. I decided they would be sand dunes. I received parts that are no longer made - like faucets, space ship parts, and blocks with old Lego space logos. I based many of the people on video game characters, including many Final Fantasy games, Chrono Trigger, Secret of Mana, and other Super Nintendo and Game Boy games. Unfortunately, I had decided that I should be more creative and make more of my own characters (I did have a few), and I disassembled all the creative combinations I had come up with to imitate the game characters. By then, I was older and moving on to new activities, so I never returned to finish it. The name of this place was also based on a video game location. In Final Fantasy (the first one), there is a kingdom named Coneria. It was actually mistranslated or misspelled, and it should have been Cornelia. In the game, Coneria seemed to be a central place where people would congregate. It was literally in the middle of the map of the world, and it appeared massive. It seemed like just the place to be, so I named my kingdom Conerea, changing the penultimate letter (as if that would mask where I got it!). As I played in this kingdom, I developed many stories. There was a big war with two wizards who gradually hypnotized all the residents and turned them against each other. There is a entire mythology about the world and the spirits that inhabit it. In High School, I wrote a short story about a conflict between two countries set in this world. Eventually, I want to clean up my old Legos and let Luca play with him, and I hope he has just as much fun and just as many imaginative stories as I did.